This compact actuator uses JASC’s patented FlexJet® Servovalve technology. The FlexJet® Servo provides excellent response and contamination tolerance in a small package, resulting in a compact, high-performing linear actuator. It was originally designed to position a pintle in throttable rocket engine, and comes with a flight-grade electronic control unit. 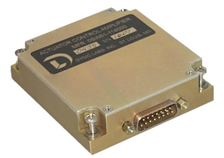 A high-accuracy linear potentiometer provides position feedback to the external controller. A single D38999 electrical connector communicates all signals to and from the controller.